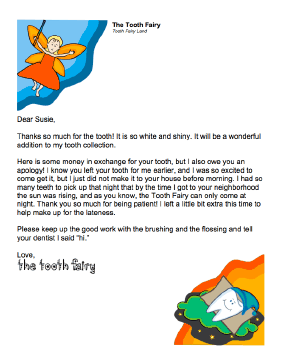 The Tooth Fairy is very busy, and occasionally misses a house or even forgets for a night. This printable letter offers an apology and explanation. Thanks so much for the tooth! It is so white and shiny. It will be a wonderful addition to my tooth collection. Here is some money in exchange for your tooth, but I also owe you an apology! I know you left your tooth for me earlier, and I was so excited to come get it, but I just did not make it to your house before morning. I had so many teeth to pick up that night that by the time I got to your neighborhood the sun was rising, and as you know, the Tooth Fairy can only come at night. Thank you so much for being patient! I left a little bit extra this time to help make up for the lateness. Please keep up the good work with the brushing and the flossing and tell your dentist I said "hi."